One afternoon when Myles Wittman and Rory Aronson were hanging out on their porch, they discussed how great it would be to put a few tools and a pump near the sidewalk for the public to service their bicycles. The idea quickly snowballed and soon the Bike Med Kit was born. After a few weeks of design, tinkering, and website building, a pilot program was launched in San Luis Obispo. Four units were placed in town: one at Myles and Rory's house, two at bike shops, and one at a cafe. As bike commuters, tourers, and builders Rory and Myles live bicycles. They understand how annoying it is to get a flat at the start of a busy day with no pump, and how saddening it is to learn that a friend has been riding the bus all week because they have not had time or resources to fix their shot brakes. In Myles and Rory's opinion everyone should have the ability to ride their bike at all times. This is done by empowering bikers to believe that they can take on repairs themselves. Repairs, however complicated, should be viewed as simply as the necessary action of applying a band-aid to a cut. Almost all repairs can be done with the same simple set of tools and a good how-to video for the inexperienced. Here, Myles and Rory present their Bike Med Kits, a gift to biking communities near and far in the hope that no biker go without the resources to fix their own bike. Thanks for checking out our website. Ride on! Rory on his first solo bike tour down the southern coast of California, 2010. 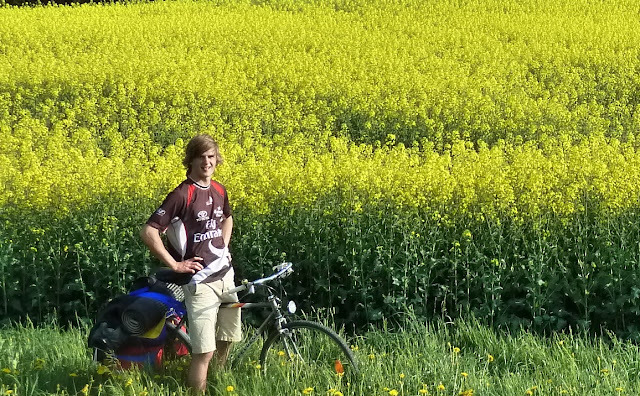 Myles on bike tour in Switzerland, 2011.